One of the gifts I asked from this year was the Kitchen Aid Pasta attachment (thanks again Nicole)- and that is what I used with these noodles. It's much easier to use than the hand-crank! 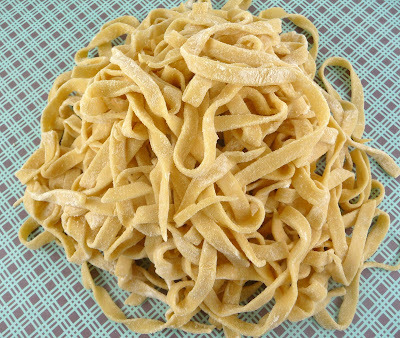 I cannot wait to keep making homemade pasta - it really is pretty simple and still just as fun as I remember. 1. In the bowl of a stand mixer fitted with the paddle attachment, combine the eggs, 1 tablespoon water, olive oil and flour. Mix on low speed until the ingredients are well mixed and a dough begins to form. If the mixture is not coming together add more water, 1 tablespoon at a time just until the dough is formed. 2. Remove the dough from the mixer and transfer it to a work surface. Knead 1-2 minutes by hand. Cover with a clean towel and let rest for 20 minutes before proceeding. 3. Divide the dough into four equal pieces. Flatten each piece with a rolling pin until it is flat enough to go through the pasta sheet roller at its widest setting. 4. Run the dough through the sheet roller on its widest setting once. Remove the sheet from the roller and lay it on the work surface lengthwise. Bring both outside edges into the middle, folding the sheet into thirds. Flatten with the rolling pin until flat enough to go through the sheet roller on the widest setting once again. Pass the folded sheet through the roller, open end first. Remove the sheet from the roller and lay it on the work surface lengthwise once again. Fold the sheet into thirds as before, flatten with the rolling pin and pass through the roller once again. Continue this pattern until the dough is smooth and supple, approximately six to eight times total. 6. Set the sheet aside on a floured surface, cover with a towel and repeat the entire process with the remaining three segments of dough. 7. Once all the pasta sheets are finished, pass through a noodle cutter if desired. 8. 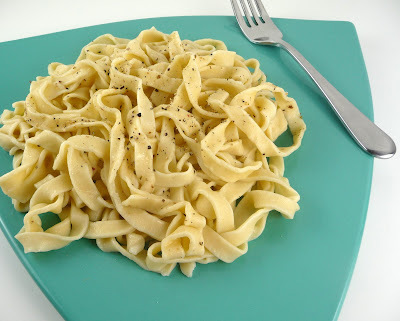 Cook the pasta in a large pot of boiling water until al dente, 2-5 minutes. Drain well and serve.